The number of grey seal pups on an island off Pembrokeshire has dropped by about 90 since it was hit by Storm Ophelia, the RSPB has said. The charity, which owns and manages Ramsey Island, said the storm caused "devastation" to the seal pupping beaches. 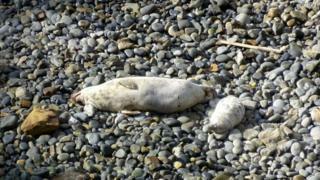 Site manager Greg Morgan said a count on Saturday revealed 120 seal pups, but after Monday's storm only 31 remained. He said it was "remarkable" anything had "survived the onslaught". Mr Morgan said Ramsey Island was the largest pupping site for grey seals in south west Britain, with between 500 and 700 pups born between August and November each year. He said 2017 had been "turning out to be a productive season" and many pups had already been weaned and left the island before the storm arrived. But he said the sea was "too rough" to go anywhere other than the harbour on Monday and it was "exhausting to watch" the cows trying to prevent their pups drifting too far out. Of the surviving pups, Mr Morgan said: "A lot of these appear to have been orphaned with the cows taking the decision to save themselves and abandoning. "Some will be old enough to take care of themselves but for many that simply won't be the case. "On the one hand we've seen some remarkable feats of survival by tiny pups being tossed around on boiling seas, but Ophelia has been brutal and had a devastating impact on this year's pup survival rates."